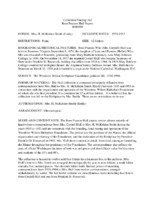 The Rose Frances Hull papers consist almost entirely of handwritten correspondence from Mrs. Cordell Hull to Mrs. H. McKelden Smith during the years 1935 to 1953 and are concerned with the founding, fund-raising and operation of the Woodrow Wilson Birthplace Foundation. The period saw the purchase of the Manse, the official organization and charting of the Foundation, and the dedication of the Birthplace by President Franklin D. Roosevelt in 1941. Mrs. Hull shows interest in detail, from fund-raising to furnishing the Manse throughout her presidency of the Foundation. The correspondence also reflects the aura of official Washington in times of both war and peace and should have value for historians and students of the 30’s and 40’s. The collection is housed in twelve acid free folders in a document box in the archives. Mrs. Hull’s letters to Mrs. Smith are arranged chronologically by year in nine folders; a tenth folder contains five undated pieces. The eleventh folder holds thirteen pieces of incoming correspondence from 1938-1944 to Mrs. Hull from twelve correspondents, arranged alphabetically by writer. The last folder contains six miscellaneous items including four letters from Cordell Hull and one from Franklin D. Roosevelt. There is no restriction on using the collection.